As promised, here is my experimental foray at the wrapping technique used on the 18th Century Spanish hat from the V&A’s photo collection. I tried out three different methods of making the floats. First, this is the second swatch. My initial attempt was working this in the flat. It was a mess. So I switched to working in the round, on the principle that the inspiring hat was probably knit in the round. The largest section on the bottom (green arrow in the photo) was done using Tamar’s suggested method – bringing the yarn to the front of the work, slipping the stitches to be wrapped purlwise, moving the yarn to the back of the work, returning the slipped stitches to the left hand needle and then knitting them off. You can see that it works nicely, but has a tendency to distort the stitch immediately preceding the wrapped segment. This is most evident in the columns of wraps, in which the same stitches are wrapped on several succeeding rows to produce a vertical column. It’s still there on the area where I shifted the wraps to produce a diagonal, but it is less evident. 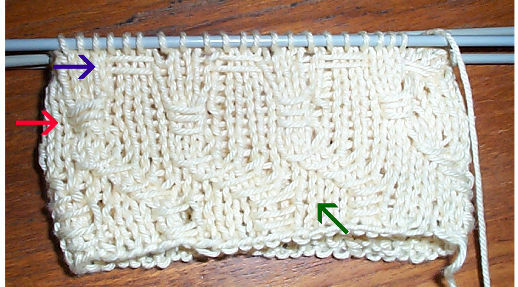 The second section (red arrow) was done using the method I first posited – moving the yarn to the back of the work, slipping the stitches purlwise, bringing the yarn to the front of the work, returning the slipped stitches to the left hand needle, tucking the working yarn behind again, and then knitting off the formerly slipped stitches. It has slightly different weaknesses than Tamar’s method. In this case, I seem to be more prone to drawing the loop too tightly, and there is also a slight distortion of the stitch immediately preceding the wrapped section. It does however look just a little bit neater to me. The third method (blue arrow) was one that came to me while I was fiddling with the other two. I worked those final two rows of wraps not as wraps, but in two passes. On the first pass I brought the yarn to the front, slipped the stitches that I wanted to “wrap”, returned the yarn to the back, slipped the plain stitches after them, brought the yarn to the front, slipped the “wrap” stitches, returned the yarn to the back, and slipped the plain all the way around. This laid one continuous thread in a single loop around my work. Then I knitted off the entire row. You can see I had time to do this twice. This does make a neater line than the wrapped methods, but has other drawbacks. First and foremost – it’s hard to keep an even tension on the continuous loop as it’s carried around the entire piece. Second, having a single continuous loop limits knitting’s natural elasticity. While this might be a useful technique to help maintain tightness in areas you don’t want to stretch out (like on the cuffs of an all-cotton sweater), I don’t think it is optimal for a hat. Now going back and looking at the V&A picture again, it does look like there’s slight distortion of the stitches immediately before the wraps, and the wraps do look more like the slightly bowed ones produced by both Tamar’s and my posited methods. Without seeing the artifact itself, it’s hard to say which of the two was used. I lean to mine, just because I can control the distortion a little bit better with it than with hers, but both are functionally equivalent, and I’d say both are possible use case candidates that can’t be entirely ruled out without actually seeing the artifact’s front and back, both close-up.